Taking the perfect picture is nowadays much simpler than it used to be. You no longer have to take thousands of pictures until a perfect one is shot. Also, you no longer have to use different artificial additions in order to remove blemishes. There are different programs that you can use on your computer to simply make pictures perfect. The problem is that most of the options available for you in terms of software are pretty expensive. Because of this, you want to seriously consider the opportunity presented by Windows Photo Editor. This is a program that offers one of the best blemish remover features on the market at the moment at a price tag that is so much lower than what you see with the really popular programs. You can easily utilize Movavi Photo Editor photo editing software to remove many imperfections by following simple steps. You need to launch the special remover program and then add the image that you want to modify. Opening is done with a simple browse feature. The next step is to use the special Object Removal feature. A brush can be used to mark exactly the element that has to be removed. Besides the brush, if the blemish is larger, the Magic Wand or the Lasso tools can be utilized. Be careful about it and then remove the blemishes with just a few clicks. Do repeat this step until the image is free of absolutely all possible blemishes. This is an optional part of the process. 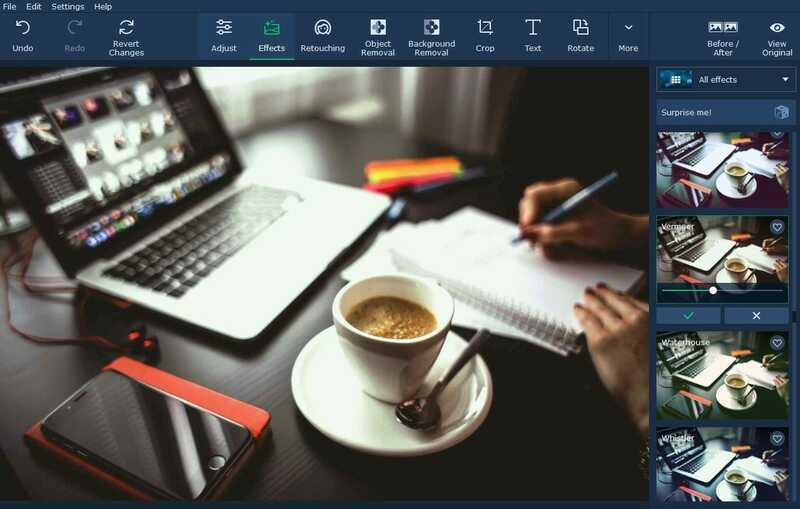 In most cases, you do not really need to worry much about this feature but if you want something that is perfect, you do want to take advantage of it as it is included in Movavi Photo Editor and can make the results better. The idea is that automatic removal is sometimes not going to be perfect. With this in mind, the clone stamp tool will simply guarantee that everything is perfect. Using it is based on following on-screen indications. That is how easy it is. Also, if you want to add make-up to someone’s face, it is something that can easily be done as an extra. After you are done with step 3, you just have to save the newly edited image. The result is an image that is free of all the blemishes you hate in your images. As you can so easily see, it is not at all difficult to remove imperfections from your images with the use of the Movavi Photo Editor program. You surely already realized how easy this process is, like putting on your favorite photographer T-shirt. To make matters even more interesting, the popularity of this software also grows because of the various extra features that are included. All you have to do is visit the official website and you will definitely figure out what extras are included. See if the program offers more than you need and if so, do consider the software. It will be cheaper than alternatives.